Jennifer Petrocelli is a licensed real estate professional committed to delivering the highest quality of service to her clients. To her, real estate is a means of people finding a new home to plant their roots, raise their family, expand their wealth, or relax and retire. Growing up with a father who owned and operated a construction business and real estate brokerage, Jennifer has understood the importance of quality construction and detail from a young age. She has an extensive sphere of professionals for any job referral, and knows how to highlight the special features of your home. 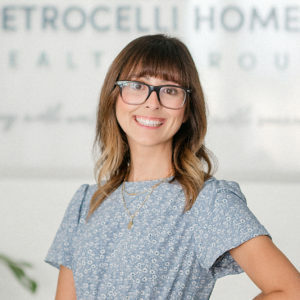 Her passion for interior design and real estate couple well as she fell in love with the character that each home has, and the beautiful people she gets to help transition from one to another. Jennifer began her real estate career working behind the scenes in transaction coordinating, and then transitioned to new home development sales. From there, she moved into residential home sales, and has over $15MM in sales to date. Jennifer is now a notable residential sales expert and marketing force, and is avidly engaged with new properties on the market and well-versed on industry-related updates. When it comes to establishing deals, Jennifer has a proven track record of negotiating terms that exceed her clients goals and expectations, and brings an objective voice to a very subjective situation. Her keys to success include attention to detail, a positive attitude, and an honest and straightforward approach to buying and selling real estate. For sellers, she has a keen ability to develop strategic marketing plans with a strong understanding of social media, for maximum exposure and the highest possible returns. Jennifer provides an individualized client experience, has developed long-standing relationships with her clients, who turn to her time and again to handle their transactions and referrals. Her warm and intuitive nature helps guide clients through the complicated Bay Area real estate market. Outside of real estate, Jennifer loves to enjoy the many outdoor activities that the Bay Area has to offer; from camping and hiking, to spending the day at the beach, or simply enjoying the peaceful charm of gardening in her own backyard. She also loves to explore local eateries with friends!